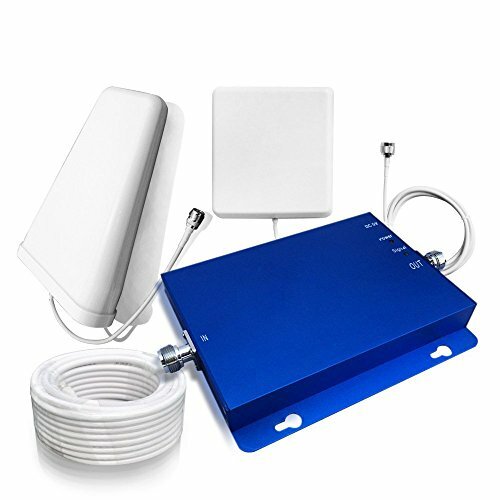 Sanqino Cell Phone Signal Booster for Home-Increase coverage Band2 Band5 850MHz/1900MHz for Mobile Repeater Verizon AT&T T-Mobile Cellular and etc up to 2000 Sq Ft. Features: 1.Boosts signal for most U.S. & Canadian cell carriers. 2.Friendly, customer support and service. 3.All components needed for installation in one package. 4.Nice appearance, High-quality and Easy installation. Specification: 1.Frequency Range: Uplink: 824-849Mhz/1850-1910Mhz Downlink: 869-894Mhz/1930-1990Mhz 2.Max Gain:67dB 3.Bandwith: 25Mhz+60Mhz 4.Power Supply: AC：100~240V, 50/ 60Hz；DC：5V 2A 5.RF connector: N-Female Packag Included: 1x Cell Phone Signal Amplifier (Dual Band Signal Repeater and Blue Color) 1 xOutdoor Antenna (White Color) 1x Indoor Antenna (White Color) Total about 50ft Cable (White Color). 1x Power adapter. EASY INSTALLATION: Step1. Search a position where can receive good signal by your cell phone (more than 2 or 3 bars). After that you can install the Outdoor Antenna on that location, towards to the base station or Cell Tower. Step2. Use the cable to connect the Outdoor Antenna and Signal Booster. Step3. Connect the Indoor Antenna and Signal Booster. Step4. After finished all parts then please check all connectors well again and trun on the power. Step5. The Installation is Complete. NOTES: 1.This is the 850Mhz/1900Mhz Dual band cell signal booster, please kindly check the frequency which is working for your mobile operator in your area before you purchase. 2. If you have any questions, please kindly to send us the email before you purchase. 【Frustration Free Set Up】 The Simple Instructions And DIY Installation Make It Easy To Get Your cell phone Booster Set Up And Working Quickly. All of the Components You Need For Installation Are Included In The Package With Easy To Read,Step-By-Step Instructions.Customer Feedback The Booster Can Be Installed In Ten Minutes. 【Performance Guaranteed】 Manufacturer 2-year warranty and 30-day money-back guarantee. If you have any questions about this product by SANQINO, contact us by completing and submitting the form below. If you are looking for a specif part number, please include it with your message.